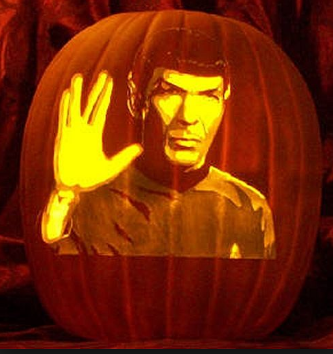 That ever logical Vulcan of Captain Kirk’s Starship Enterprise is giving us all a very logical suggestion: Pumpkins – the Halloween Jack O Lantern kind – are indeed, quite logical. Can pumpkins really spur on a logical conversation about the benefits of using logic on Halloween? “Pumpkins are logical items for the full, seasonal enjoyment of the Earth tradition known as Halloween.”, said First Officer Spock, when pressed about why he was featured so prominently on the bulbous vegetable.